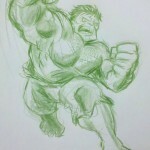 SuperFogeys - Drawing should be FUN: The Incredible HULK! How much do I love drawing? It ranks somewhere in between my daughters and plans coming together in my list of things I love. Yes, that’s a LOT. I may not always end up with a product I’m proud of, but the process of drawing never stops being fun for me. Every drawing is a mystery that needs solving. How does one make a powerful superhero appear on a blank piece of paper? Every stroke of the pencil is another clue to solving that problem. I can’t guarantee any sort of frequency, but I intend to periodically post here some non-Fogeys related drawings I’ve done just for fun. 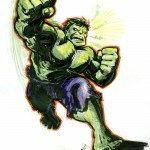 Today’s installment is an action packed drawing I recently did of Marvel’s the Incredible Hulk. 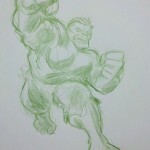 This is my attempt at drawing a fun, powerful, Kirby-esque Hulk in the Mighty Marvel tradition. It’s not a perfect drawing. One could easily critique many flaws in this, but it’s a sketch I did for fun, and that’s all that matters. As I was drawing this I stopped occasionally to snap a pic of the progress so you could see how it evolved. Check out the gallery below. 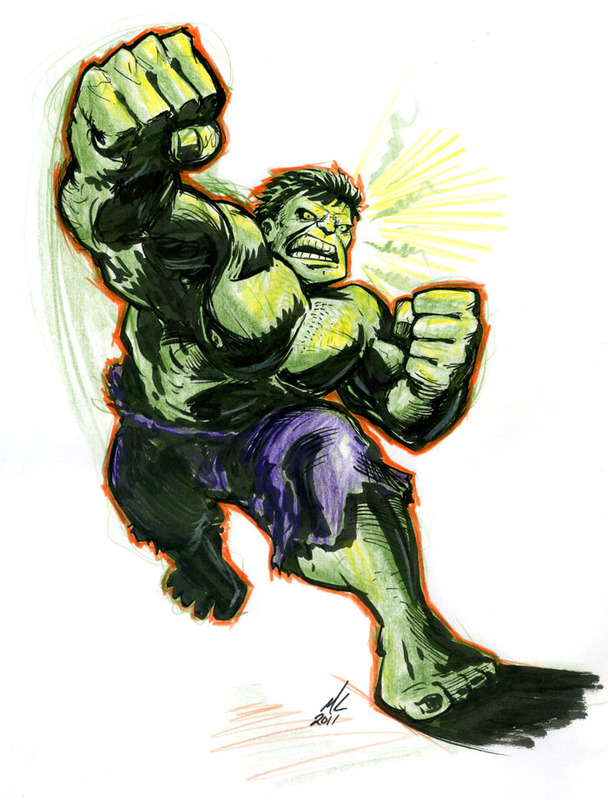 I drew this on a regular piece of 8 1/2″ x 11″ copy paper using primarily an olive green Prismacolor Verithin pencil. I do a lot of my sketching with these pencils. I like the smoothness of them and, in a way, the unforgiving nature of them. They do not erase easily so it forces me to be very careful about what I’m drawing and how I use the pencil. I keep the pencil real light on the paper and I search for the lines and shapes I want. 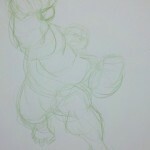 Once I’m where I want to be, I press a little harder to darken and tighten up the sketch. As a result, my sketches end up with an energetic, unrefined look. 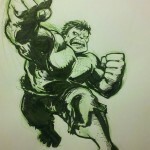 After getting the sketch to where I liked, I then took out my Kuretake brush pen and laid down some heavy ink. Then out came one of my trust Pigma pens to put in some tighter lines and more detail. 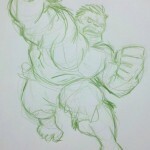 The colored pencils came back out to give the sketch it’s final shot of gamma irradiated energy. And there you have it, drawing should be fun, and this one was. it IS fun! I really like the action!